Dedicated League member Patty Biasca writes to you about why she will provide for the redwood forest long after she’s gone. 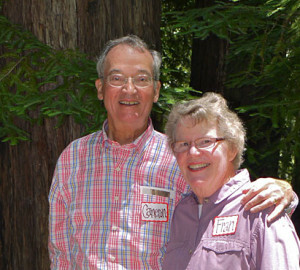 Now James and Carmen Hickling’s love for Calaveras Big Trees lives on through a generous bequest, which supported construction of the park’s new visitor center. The center hosted a grand opening last Memorial Day. This new center honors the legacy of those who preserved these groves in the past, and tells the story of the giant sequoias. Did you know? You can donate through your IRA, and cut your taxable income! Download your new, free Family Guide to the Giant Sequoias. You can honor your loved ones and benefit the redwood forest this holiday season. For as little as $5, your honoree will get a lovely ecard letting them know you’ve made this special gift. For just $25, your ecard can accompany a gift of a League membership, and for $75, your paper or electronic card will announce that you have had a seedling planted in a redwood forest. Learn more. SAN FRANCISCO (December 3, 2013)—Save the Redwoods League has joined #GivingTuesday, a first-of-its-kind national effort that will harness the collective power of a unique blend of partners—charities, families, businesses and individuals—to transform how people think about, talk about and participate in the giving season. Coinciding with the Thanksgiving Holiday and the kickoff of the holiday shopping season, #GivingTuesday will inspire people to take collaborative action to improve their local communities, give back in better, smarter ways to the charities and causes they support and help create a better world. Learn more about #GIVINGTUESDAY and give today! Please continue making a difference for the redwood forest-renew your membership. You may celebrate Valentine’s Day with chocolates or a bouquet of red roses. But Piedmont, California, attorney Cameron Wolfe gave his wife Fran something much bigger: He worked with Save the Redwoods League to dedicate the Fran B. Wolfe Redwood Grove in Pfeiffer Big Sur State Park. See how the grove helped her bounce back. Send your loved one a free redwoods Valentine’s Day ecard, and see our new ecards gallery. Thanks to your gifts through the seedling planting program, more than 2,000 redwoods and 2,600 Douglas-firs have been planted in the last two years to restore logged forests in and around Humboldt Redwoods State Park. Ancient redwoods were logged heavily for decades, but your donations make possible the effort to heal these lands. These plantings are a timeless commemoration of your loved ones. Your gifts also support education programs that bring the wonder of the redwoods to young students. Learn more about how you helped. It’s why Save the Redwoods League exists – giant redwoods, centuries old, up for sale by private owners. A developer or timber company has put in a bid for the property. We must be prepared to respond quickly with funding in place. Help make sure we are always ready by donating to our Emergency Projects Campaign. Learn how your gifts to this fund protected redwoods recently. With our members’ generous support, Save the Redwoods League achieved many successes in 2011, including purchase of the ancient Noyo River Redwoods and one of the last pieces of privately held land in Redwood National Park. You are at the heart of that success. Please renew your League membership or join today. You’ll enjoy the immense satisfaction of knowing that you’re helping to safeguard the redwoods, a world treasure. Thank you. More than 170 Save the Redwoods League members enjoyed a cookout, music, kids’ activities and guided hikes on our July 16 Member Appreciation Day at Henry Cowell Redwoods State Park (pictured). Not a League member? Join now for only $19 to be invited to next year’s event! Dedicate a Grove: Arrange Tours to Choose Yours! Summer brings beautiful weather for touring groves that you can dedicate to a loved one or group through Save the Redwoods League. Learn more about dedicating a grove. Joanne Wilson has been a Save the Redwoods League member for more than a decade. After witnessing firsthand the destruction of the redwood forest, she knew she had to help. Read her story and learn how she named the League in her will to help protect the awe-inspiring redwood forests for future generations. Learn more about naming the League in your will or trust or dedicating a tree or grove.